►Scotch: From Scotland! Mostly famous for using PEAT (bricks of dead, compacted leaves) to smoke the grains during the malting process. Scotch is typically (but not always) smokey, sometimes with notes of leather, game meat, or even sausage/chorizo! Not all Scotch is peated, and some that are made from coastal grains are also famous for picking up IODINE from the ocean's seaweed. Iodine gives a brilliant smell of new leather, fresh paint, nailpolish, or a newly opened can of tennis balls! ►Irish: famous for lightly roasting the grain, so the color & taste of them tends to be light golden vanilla & honey. They are known to be the easiest drinking whiskies. ►Bourbon: made mostly from corn, so tend to be a bit sweeter & thicker than other whiskies (think of corn syrup...with notes of toffee, caramel, & butterscotch.) Most Bourbons are kept inside heavily charred wood barrels, so they can also pick up a spicy-campfire-hot cinnamon flavor too. The most famous Bourbons are from Kentucky, but they can be made in any part of the world. ►Rye: made from a very peppery type of grass (Rye Grass) so whiskies made from Rye are very pungent & spicy, and are sharper and leaner than the corn-based Bourbon. Because they are less sweet than corn-heavy Bourbons, they also tend to showcase more wooden/resin/forest elements. They can be made in any part of the world, but are well known from Canada and parts of the U.S. SINGLE MALT vs BLENDS: in general, single malts are made from one grain (Barley) from ONE parcel of land that is farmed, harvested, and malted by the landowner/distillery. They are made from a single grain but can be a blend from different barrels, but all from ONE distillery. The significance of one "controlled" parcel is that the grains grown there will be highly unique in flavor, specific to that one and only parcel in the world. Then, the influence of craftsmanship (from the distiller) is also highly unique due to the ONE artisan who is carrying out the final "recipe". Blends do not follow this protocol, AND, they may be a combination of both malted and un-malted grains. Customers may ask for no ice (Neat), ice (Rocks), or they may even specify just 1 or 2 cubes. 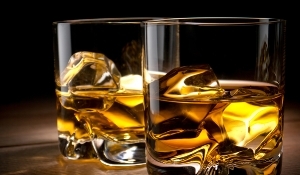 This is based on the concept that if you add a small amount of water to whiskey (even in the form of melted ice), it breaks up the aromatic molecules and then increases & enhances smell & flavor; but, too much water dilutes the whiskey. So each customer will have a distinct preference. A very large ice ball or chunk is now the "popular" way to serve whiskey on the rocks (rock!) because the larger the ice, the slower it melts! Even ONE DROP of water added into your pour can completely enhance the flavor! !